What's behind North Korea's surge of friendly visitors? China remains North Korea's most significant trading partner and economic supporter, always opposing the harshest of sanctions for its smaller neighbour. But as Pyongyang accelerated testing of missiles and nuclear devices, its frustration was beginning to show. That changed when Kim Jong-un took a slow train to Beijing for his first ever meeting with Chinese leader Xi Jinping last month. The latest manifestation of this slow but steady mending of ties between the neighbours was the weekend visit by a Chinese artistic delegation led by senior official Song Tao, the head of the Communist Party's International Liaison Department.On Sunday, North Korea's state-run Central Television showed Kim Jong-un greeting the delegation and meeting the Chinese envoy in a hall decorated with a huge portrait of Chinese leader Xi Jinping.Inside the train Kim travelled to China inWhy Xi's still the one Kim needs to seeThe political gamble of the 21st CenturyNorth Korean TV's famous "lady in pink", senior newscaster Ri Chun-hee, generally brought out for more significant bulletins, came forth to praise a "new era" of relations between the two countries. Mr Kim went on to host a "grand" banquet for the visiting Chinese delegation, where toasts were made to the "steadfast will of the two parties and two peoples, to more beautifully decorate the flower garden of the DPRK-China friendship". There, another enormous image of Xi Jinping looked down from the stage. It's a signal to China as much as it is to the world and those North Koreans with access to this media that the old alliance is certainly not fractured. This has also provided an opportunity for a solo engagement for Mr Kim's wife, the "respected Madame Ri Sol-ju" who was shown greeting China's Mr Song at the theatre, and enjoying a performance of 'Giselle' by the National Ballet of China.It's the first time that Mrs Ri has been seen in North Korean media without her husband and she was presented as the "First Lady of DPRK" (Democratic People's Republic of Korea, the country's official name) for the first time.She had only previously been presented as "Comrade", South Korea's Chosun Ilbo newspaper says.With KCNA news agency filing the report under "Supreme Leader's Activities", this is an indicator of the greater role both she and the leader's sister Kim Yo-jong are playing in North Korea's PR initiatives. South Korea was the first to send over a cultural troupe when in early April several star acts performed in Pyongyang. Among them was K-pop band Red Velvet, known for their upbeat electronica and Mr Kim addressed rumours that he was a secret fan in comments quoted in a pool report at the time. Kim watches K-pop idols in peace concertThe South Korean rock band returning to perform in Pyongyang"There had been interest in whether I would come and see Red Velvet. I had initially planned to attend a performance the day after tomorrow but I came here today after adjusting my schedule"I thank you for this kind of gift to Pyongyang citizens. "A Red Velvet band member's subsequent comment that it was an "honour" to meet Mr Kim divided many in South Korea, with some accusing her of humanising a reckless leader. For some critics, the comments by Mr Kim were little short of a careful and canny exercise in soft power and humanising an unreadable figure at a critical moment. Pyongyang, an international cultural hub? The first two weeks of April also saw Pyongyang's first international singing contest, with artists visiting from Kazakhstan, Armenia and Mongolia. It was won, hardly surprisingly, by a North Korean singer. But it marks a clear-cut offensive on the part of state media to present Pyongyang as an international cultural destination. In that vein, the recent Spring Friendship Art Festival featured performers from Bulgaria, Russia and Laos, alongside a Singapore-based stage magician called Mr Bottle.This was a performance deemed important enough to clear Central TV's early evening schedule on 16 April. 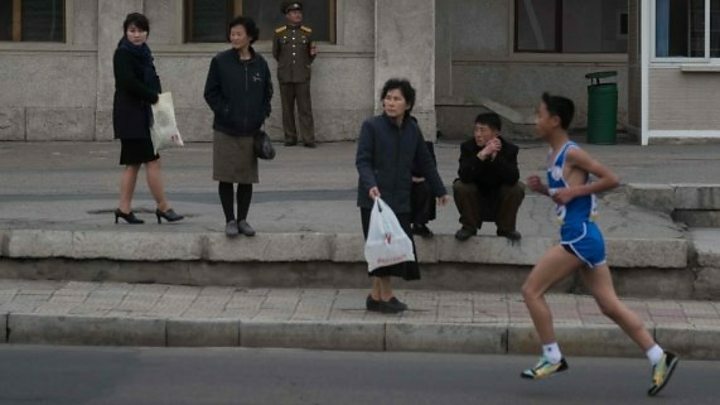 As a contrast last week's annual Pyongyang marathon was not given as much domestic coverage as in previous years. While official reports noted the presence of sport minister Choe Hwi and competitors from around the world, the number of foreigners taking part was less than half of last year's race. One company organising tours to the race said that people were still travelling despite government warnings against going to North Korea, following the death of American student Otto Warmbier last year and the country's poor human rights record. But North Korean state media have made sure that foreign tourists are still visible, with state television airing English-language interviews with visitors to Pyongyang's Juche Tower on the occasion of Day of the Sun, the birthday of state founder Kim Il-sung. It's been an unprecedented few weeks for North Korea's relations with the world but the glowing narrative of star-struck audiences and smiling performances are no accident. For the message-makers in state media, politics is likely to be in mind. BBC Monitoring reports and analyses news from TV, radio, web and print media around the world. For more reports from BBC Monitoring, click here. You can follow BBC Monitoring on Twitter and Facebook.